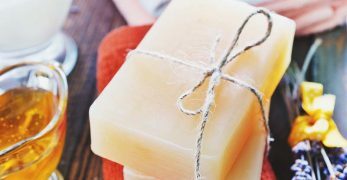 I am a full-time homesteader living on a tight budget. I am always looking for ways to save money. For a while, one of my most significant homesteading expenses was buying straw or other bedding for my livestock. 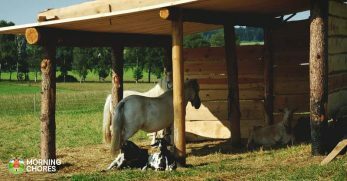 Luckily, I figured out ways to raise livestock without having to keep a covered floor. 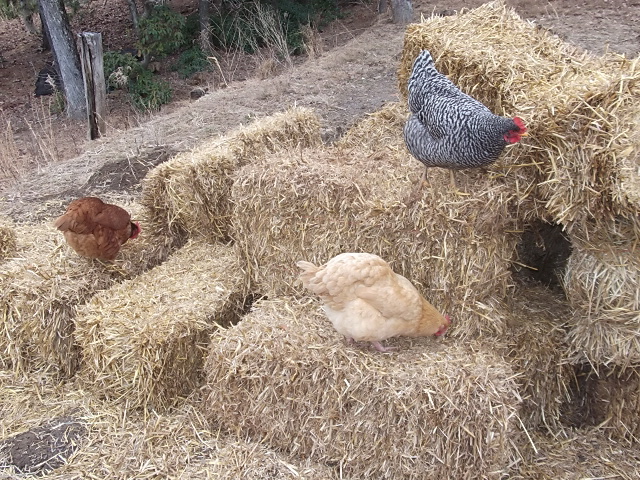 For example, with chickens, since I have a wood floor in my coop, I don't use litter materials at all. I use a flat spade to loosen stuck-on chicken poop. Then, I sweep the poop into my dustpan and either compost it or age it in a bucket for other applications. 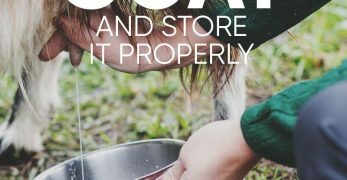 This method has saved me about $20 a month on litter for chickens. 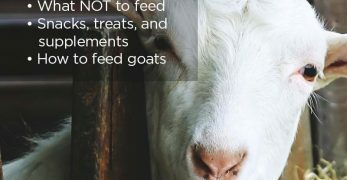 Meanwhile, I was still spending about $60 a month on bedding materials for my goats. One day, as I was cleaning the goat barn, I noticed that most of the urine was concentrated in three areas of the floor. I changed out the straw, making a note of the urine locations. 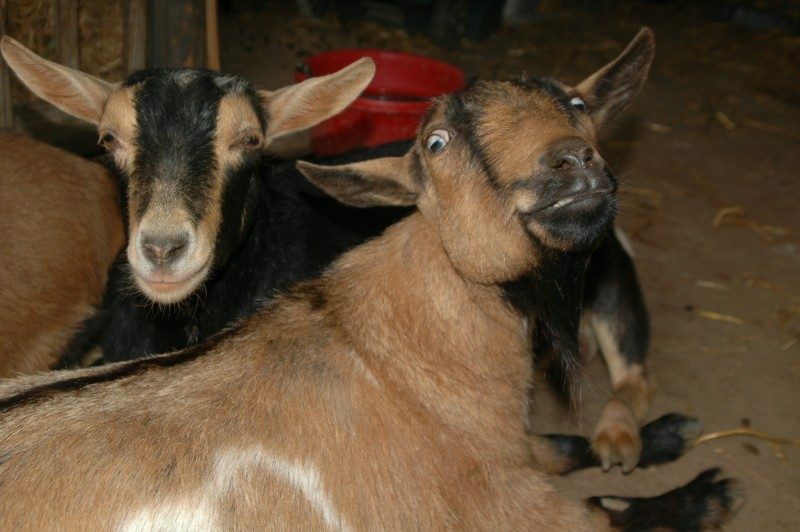 The next time I cleaned the barn, I checked to see if the goats peed in the same spots again. Yep! They peed in the same spots a second time. 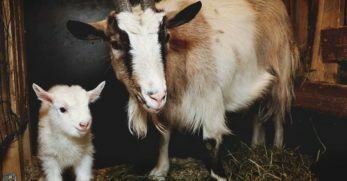 Well, my mental wheels started turning, and I began noticing other things about goat behavior. 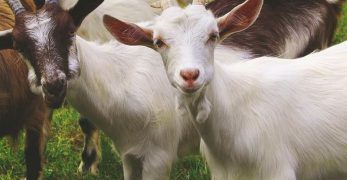 Like when my goats would sit down, they would use their hooves to move aside the straw I had strewn for them. They preferred the hardwood floor to a straw-padded one. 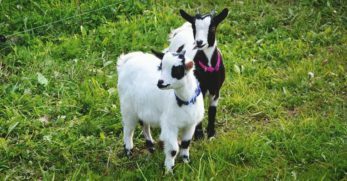 This was also true out in the pasture; the goats loved the rocky, deadpan soil on the steepest parts of their hillside to the lush grassy areas. So, one day I cleaned up half of the barn and didn't apply any straw. 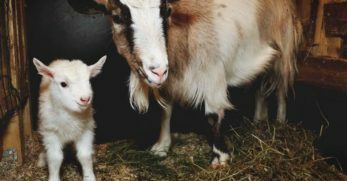 The next morning, I found all of my goats sleeping on the strawless side of the barn. I cleaned the goat barn from top to bottom, including a thorough floor washing with soap and water to dilute the urine smells in heavily trafficked areas. After that, I set up two goat litter boxes near where the goats usually peed. 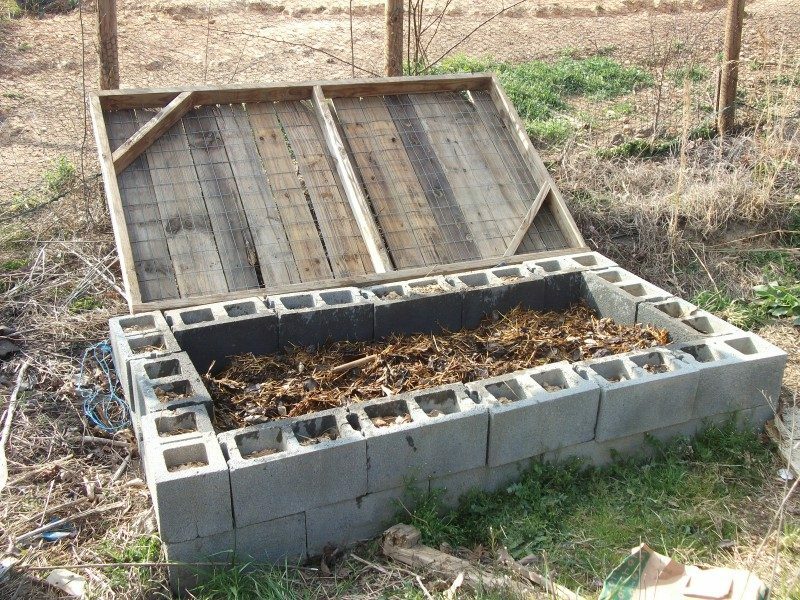 To make the litter boxes, I built a 5×4 foot box, in the same manner that you would make raised garden beds. It's important to make the litter box large enough that your goat can stand inside, turn around, and comfortably squat (girls) or stretch (boys) to pee. Otherwise, they'll miss. I have Nigerian Dwarf goats, so 5 x 4 feet boxes worked well. Larger goats may need a larger box. I filled the box with four inches of straw, applied some of their old urine smelling straw to help them get the message. Then I watched to see what happened. 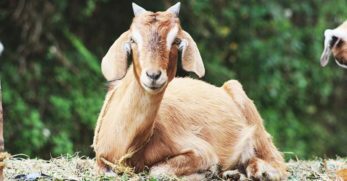 Every so often, a goat would miss and pee just outside the box. I kept a bucket of wood ash from our hardwood stove in the goat barn and covered the wet spots with ash. Once the ash did its job and soaked up the urine, I swept up the ash and put it in my compost pile. The goats didn't seem to like the wet ash on their floor, so they got better about peeing inside the box. All of my does took to the litter box in a day or two. My wether (castrated male) took a little longer to adjust. He would urinate anywhere on small accumulations of hay or straw that had been pushed from the litter box. I cleaned up those little piles and put them in the litter box so he would smell his own urine there in the future. It took a few days of constant moving of urine piles for my wether to get the message. But he finally did. During the times when my buck was allowed to visit the ladies, he was not quite as precise in his placement. He did use the litter box at times. However, he also randomly peed on his own face to attract their attention. Unfortunately, buck face-spraying can't be eradicated by a litter box. Luckily, bucks only tend to run with the ladies for a little while. Also, most of their urine spray ends up in their beards! Once everyone was mostly trained, I removed the second box so that I would only have to clean one goat litter box regularly. 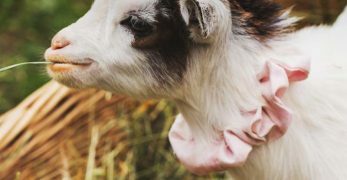 Young kids (baby goats) don't always know when they have to pee. So, they tend just to go when they have to. However, after a couple of weeks, they pick up the habit of peeing in the litter box by merely watching their mother do it. I try to keep my barn floors a lot cleaner while I have kids around since they are apt to eat everything until their sense of smell is fully developed. So, in part, just by keeping the floors clean, they gravitate towards the litter box for doing their business. Goats poop everywhere. I haven't been able to break them of this habit. So, twice daily, I sweep up their manure from their goat barn. It takes about 4-5 minutes and is as easy as sweeping our kitchen floor. I empty the dustpan direct into a dark trash can for composting. When the can is full, I roll the can out into the sun, moisten the manure, loosely close the lid (so air still gets in), and come back a few weeks later to find everything fully composted. For the goat litter box, I add a slice of straw each day. Then once a week, I pitchfork the urine straw into my 8×4 foot worm bed. Worms love urine soaked straw. Be careful not to apply more than 2-4 inches at a time, or it will hot compost and cook your worms. (My worms also get kitchen scraps and weeds to round out their diet). The wood floor beneath the litter box is occasionally damp from urine seepage when I pick up the straw. So I cover it with wood ash and then sweep that back up in a few minutes and toss it in my compost can (not my worm bin). If that doesn't sufficiently dry the floor, I let it air dry before I refill the goat litter box. 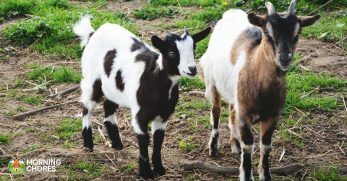 In good weather, the goats will go outside rather than pee on a bare wood floor while I do my cleaning. Every few months, I move the goat litter box over a few feet to give the floor a rest. 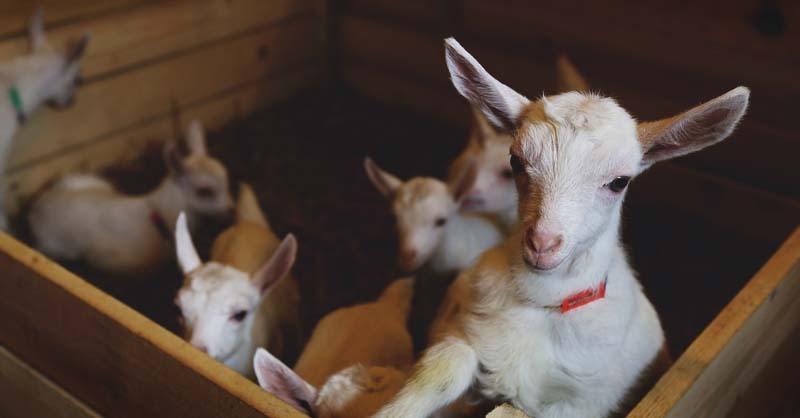 Since the goats now get the concept, they pee wherever the litter box is located. 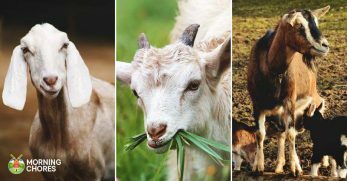 In winter, when it's cold, the goats do like to sleep in straw or hay for warmth. During cold runs, I disperse straw over the entire floor; then I put the goat litter box in place on top of the straw. Because the goats are also visually trained to recognize the goat litter box, they tend to pee mostly where I put the box frame. 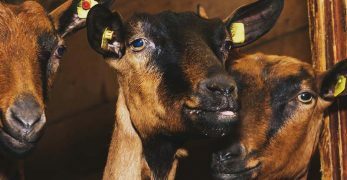 Goats are sensitive to ammonia smells, so even in winter, it's essential to clean the goat litter regularly to avoid lung issues. Usually, I empty the litter in the box each week. However, in the rest of the barn, I can layer a few inches of new straw and wait a couple more weeks before I clean the entire barn (as weather permits). 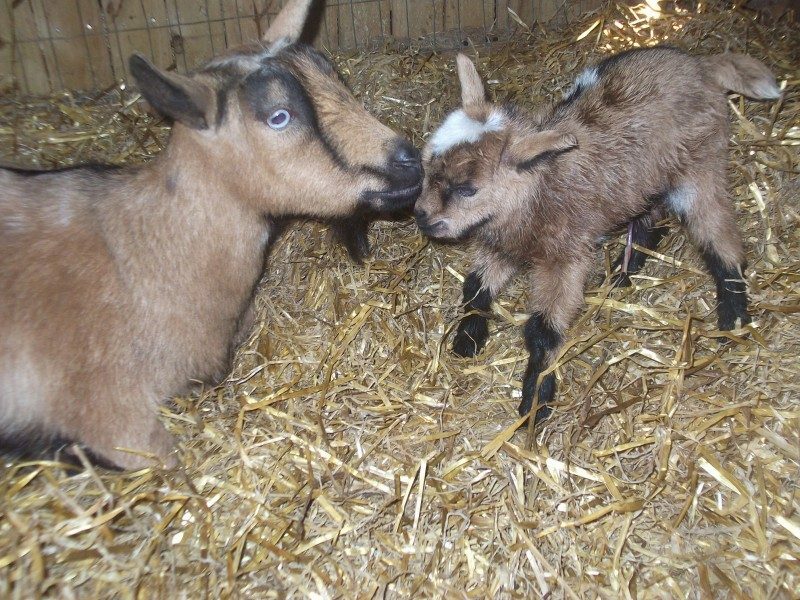 The goats do have a few more “accidents” outside the litter box when there is straw covering the entire barn floor. So, I do occasionally have to pitchfork potty-straw from other parts of the barn. 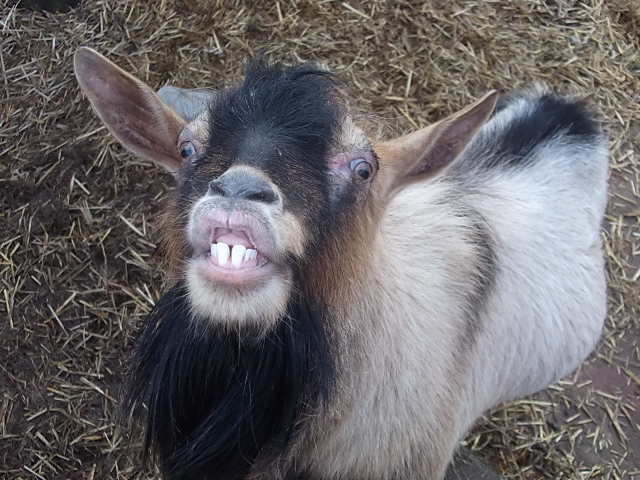 In spring, when I clear the straw from the floors again, occasionally one or two goats try to pee in the wrong place. I keep the floors swept and move pee piles over to the litter box to help them get the message. Within a couple of days, they are peeing in the litter box like pros again! 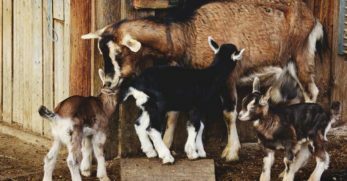 I have eight goats in my barn. 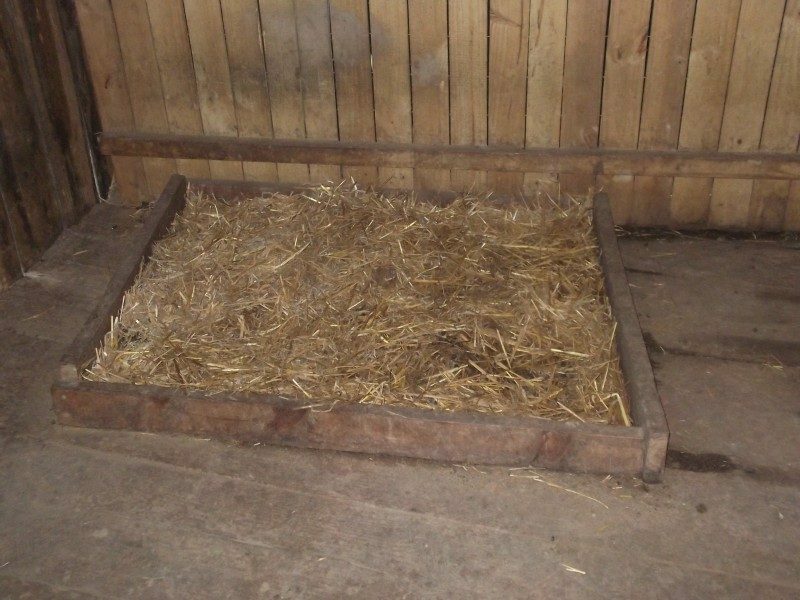 In warm weather, it takes about a half bale of straw per week for urine management. Sometimes in hot weather, they drink more and pee more, so I occasionally go through a little extra straw. In winter I use more for goat warmth, but it's still less than I used to use. 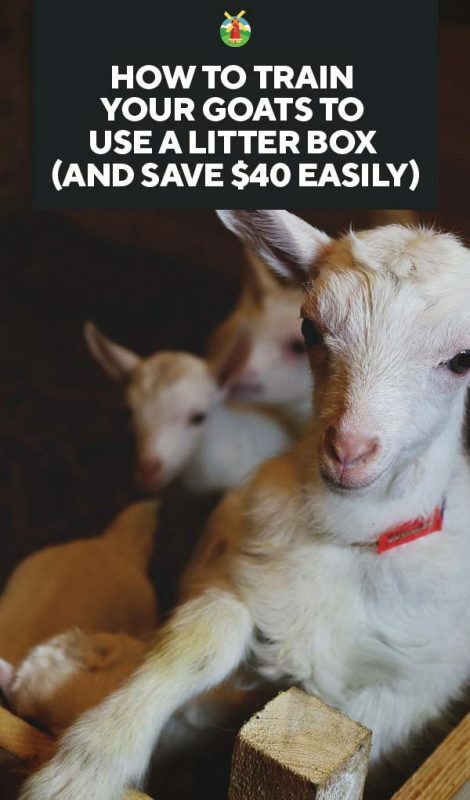 Overall, I am spending an average of $20-25 a month on goat litter, down from my starting point of $60 a month. On a homestead budget, this makes a big difference. It also cuts down on my time cleaning the goat barn. I used to spend about 10 minutes a day spreading new straw. Then each week, I'd spend 1-2 hours filling wheelbarrows and moving that straw back out to my compost pile. That's not even counting all the time I spent picking up and hauling straw bales to the goat barn! Now I spend ten minutes a day sweeping up poop, and putting it directly into my compost can, and spreading a little fresh straw. 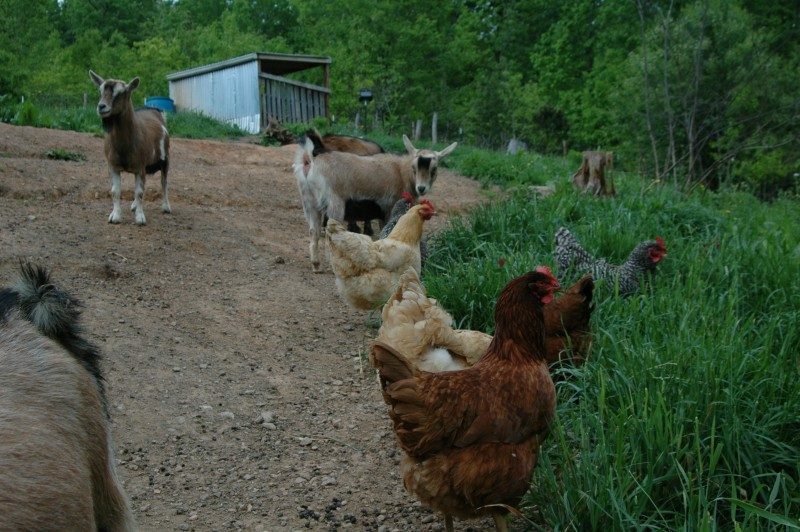 When I clean the litter box in summer, it only takes about 10-15 minutes (depending on whether the goats are in the barn “helping me” or out on their hill). Even in winter, I only spend about 20 minutes on litter box cleaning and straw spreading each week. Then about every three weeks, I spend about an hour cleaning out the old straw. Since the urine straw is the heaviest and hardest to move, having it one place and clearing it regularly cuts down on all the heavy lifting I used to do for whole barn cleanings. The really great thing about this idea is that you can try it with very little investment of time and money. 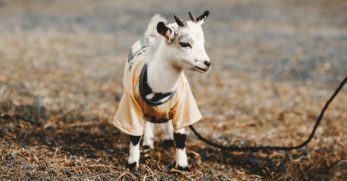 Even if for some reason it doesn't work for you, then I'd be willing to bet, you'll still learn something fascinating about your goats by putting them through this exercise. 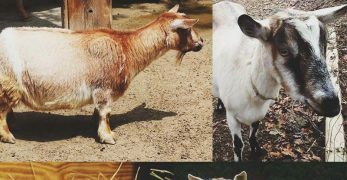 If cats can figure it out, then why not your goats?